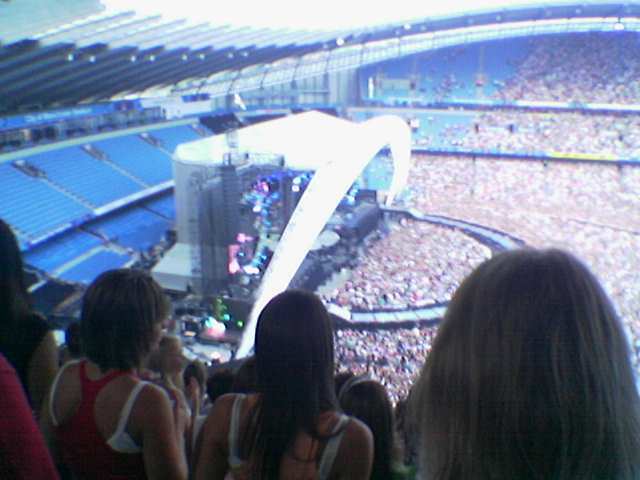 I’ve not made any secret of the fact that I was going to see Take That in concert this weekend. Certainly not my number one choice of band to see (I actually got the tickets for Claire‘s birthday) but really, whatever you think of them, whatever dissent you might show to boy bands in general, you have to find it fascinating that a pop group that split up ten years ago can still sell out the country’s largest venues in a matter of hours. I don’t really get it, and I’m not that embarassed, so I thought it might actually be interesting to see what the fuss is about. The only problem was that we’d been given probably the absolute worst seats in the place. I expected it to be a long way away, so I was prepared to only be able to see four dots jumping around the stage (or, as I’ve now learned, three jumping around and one just acting a bit wooden). However I had expected to actually be able to see the stage. Look at the picture below (apologies for the quality from my camera phone) – tell me how this is not a "restricted view" seat! The big white arch changed colour when it got dark. Very pretty. Shame that it obscured all but the very front of the stage from view, including the large projection screens! We ended up moving to the left quite a way into a block of empty seats for a better view of one of the screens, with not much less of a view of the stage – still pathetic though for a full price ticket, and whenever there was some kind of running about or dancing going on, we were oblivious. 60,000 girls and about 300 men certainly seemed to enjoy the show. The female bias was pretty severe – and the commercials they showed on the big screens were somewhat targeted towards the audience: for body spray, spot cream and… bingo! Support act was probably the safest choice in the world – the hopelessly bland Sugababes. Oh, and if you didn’t guess from the title, the real, actual Lulu was there to sing her bit of Relight My Fire. I wonder if she’s going to travel around with them the whole tour just to do half a song…?